I’ve just posted this story at Oregon Arts Watch on last night’s opening show of Skinner/Kirk Dance Ensemble’s run at BodyVox Dance Center. Four good dances, including Josie Moseley’s splendid new Flying Over Emptiness. 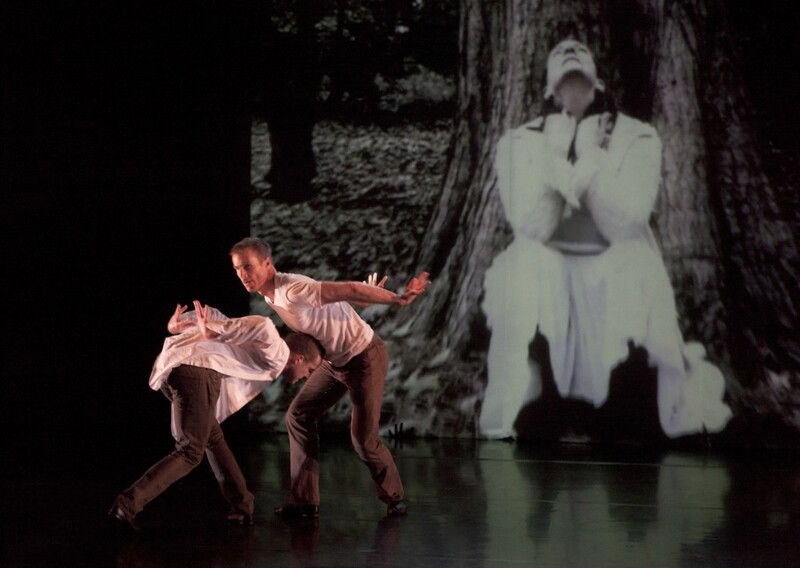 Pictured above: Eric Skinner and Daniel Kirk in Moseley’s new dance, a tribute to fellow choreographer Mary Oslund. Photo: Blaine Truitt Covert. Mr. and Mrs. Scatter spent Friday night — or at least a short part of it — at BodyVox for the opening performance of Obstacle Allusions, Eric Skinner’s new half-hour dance for Skinner/Kirk Dance Ensemble. It was the second recent new contemporary dance piece in town in which the music was an essential and equal partner to the dancemaking, defining and pushing the ideas as much as the choreography itself. (The first was Jim McGinn’s Gust for TopShakeDance, a piece that was woven inseparably with Loren Chasse’s score based on field recordings of the sounds of wind.) In Obstacle Allusions the music isn’t original: it’s taken from works by Haydn, Aarvo Part and the film composer Ennio Morricone. But the performance — by pianist Bill Crane, who is always an enlightenment and a pleasure to hear — was a highlight of the evening and a welcome reminder of the essential partnership of music and physical movement in dance. The downside of BodyVox’s ambitious move into its own new BodyVox Dance Center in Northwest Portland? Jamey Hampton, co-artistic director with his wife, Ashley Roland, of the Portland-based touring dance and movement ensemble, paused to consider the question. “We were closer to cold beer before,” he finally allowed. Surely a heavy price to pay — and the pizza was good, too. For several years BodyVox kept house in sunny but cramped quarters on the top floor of the BridgePort Brewpub,Â several blocks away from the company’s new digs at Northwest 17th Avenue and Northrup Street. One evening late last week BodyVox threw a little open house-slash-open rehearsal to show off the new space, and everyone was pretty much in a celebratory mood. Beer (BridgePort, of course) and wine were flying out of the lobby. Bodies were flying just as rapidly around the new stage, which is 60 feet wide as opposed to 40 in the old space, a huge difference in terms of choreographic possibility. The rehearsal was mostly for Water Bodies, which the company is taking on tour to Philadelphia and New York state in mid-October (the home season, which will be performed entirely in the new space, opens Nov. 12), and with a crowd on hand it was loose. Christopher Stowell, artistic director of Oregon Ballet Theatre, stood at the side of the stage with a microphone to talk about what was going on in the dances, and when Hampton and Roland weren’t out on the stage performing, they joined in on the chat, too. I talked briefly with veteran dancer Eric Skinner, one of BodyVox’s artistic anchors. He and the company were getting ready for a quick trip to Minnesota for a performance tomorrow night (Sept. 24) at College of St. Benedict and St. John’s University near St. Cloud. I congratulated him on the company’s wisdom in scheduling a trip to the upper Midwest in September instead of January. Eric grinned. “Coldest winter I ever spent was the year I danced with Milwaukee Ballet,” he said. 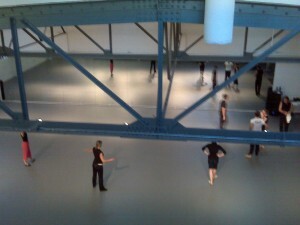 By the time everything’s finished BodyVox’s main performing space will hold 160 seats, up from 90 in the old space. “It really transforms the financial picture for us,” Loughran said. A front studio with big inviting garage-door windows onto the street was in use during the reception and already is attracting dancers for lots of classes. “That’s nice, too. Gets us back to that revenue flow,” said Loughran, whose job it is to worry about such things. Let’s just say we’re about to face-plant along a truly scouring patch of financial gravel road. Let’s just say. And those responsible for the emotional health of the citizenry (who would that be exactly?) start looking for a way to cheer us up, bread and circuses before we become an angry mob. Who should they call? Here’s a vote for Gregg Bielemeier, because nothing brings a smile to your face faster than a Bielemeier dance. His dances are a little like those old Tex Avery cartoons, Daffy Duck and Bugs Bunny, with maybe a little Fantasia thrown in to class up the act a little, the amusing bits of Fantasiaanyway. They have their own madcap illogic, the same happy spirit, the same invitation into an absurd world. And at the end of the day, or the show, they are gentle somehow, too, even Utopian a little bit. We dance, and that is good. As I was grinning through the “+Bielemeier” contribution to the Skinner/Kirk+Bielemeier dance concert, which runs through Sunday, Half of Some, Neither of Either, I finally just clicked my pen and put it back in my pocket, leaving the note-taking to someone else. I just wanted to connect to the jazzy mix of David Ornette Cherry’s winsome music and Lyndee Mah’s scatty vocals, to Bielemeier’s own madcap solos, to the sweetest duet imaginable from Habiba Addo and Eric Skinner, to the funny little bits and general joy of living tossed off by the rest of the dancers as if they didn’t have a care in the world.